True story: I haven’t had a Christmas tree since 1995 because I adopted two cats in 1996. Two trouble-seeking cats who pursued destruction with an unimaginable ferocity. It’s possible I could have put up a tree last year, when the cat count was down to one 15-year-old feline who didn’t seem quite as keen on mischief as he once was. Once you get out of the habit of NOT having a tree, however, it’s a lot of trouble to get back in the spirit. When I saw this Christmas light canvas on Pinterest, I knew it was a project I could handle. Canvas. Holes. Lights. CHECK. For weeks, I meant to buy a blank canvas, but honestly it’s hard to convince myself to drive around in Atlanta unless I’m LEAVING Atlanta. So if I can’t buy something at Publix, Trader Joe’s, Walgreens or Moes Southwest Grill, I usually find that I can get by without it. Luckily, my apartment complex parks a big Dumpster in the parking garage on my floor for folks who just can’t manage to haul their cast-offs to the first floor as they’re moving in or out. I spotted two canvases leaning against a big pile of flattened boxes one morning when I darted in to put my trash in the chute. I think it must be ex-boyfriend art. I mean, the canvases are in great shape, other than what’s painted on them. The one on the left is almost passable, except the longer you look at that big purple flower, the more uneasy and antsy it makes you. Or maybe it’s just me. Art. You know. It’s weird. I suspect I was supposed to paint over the old paintings with gesso, but all I had was some leftover beige ceiling paint and some red latex from another project. Two nights, two coats of paint. I kind of doubted my ability to complete a random shape like the writer of the original post did, so I looked for stencils to trace. I found a swoopy, modern-looking tree stencil at Altogether Christmas and ended up drawing it freehand on the back of the larger canvas with a pencil. First, however, I attempted to estimate how many “levels” the tree should have, based on the number of lights I had (150) and a rough estimate of how far apart the lights would go. And then I gave up and just drew a big swoopy tree. While watching “The Walking Dead” (holidays! guts! zombies! ), I punched holes approximately 1 inch apart along the pencil lines with a sharp kitchen knife (the original writer used an awl, and I’m pretty sure I don’t own one). An awl would have probably made it easier to make standard-sized holes; instead, I had to use my own somewhat distracted judgment. Ideally, I think, the holes should be ever so slightly smaller than the light bulbs being punched through the back. Any bigger and the bulbs won’t stay in without tape (or, I guess, glue); too small and you may stand a change of breaking the bulb trying to force it through. I had about 20 lights left over when I was done punching holes. Considering the big mess of wires draped along the back of the canvas, a few extra lights don’t really make much of a difference. The original instructions advised me to secure each light with hot glue, but that seemed like a lot of trouble. It also seemed incredibly permanent, and I wasn’t sure whether I would be able to change any bulbs that burned out if they were glued in. Sure enough, after I unplugged the strand and moved the finished product across the room, none of the red bulbs worked when I plugged the lights back in. While I don’t pretend to understand Christmas lights, I did remember that I had a small baggie of replacement bulbs. I guess I replaced the right bulb (first red one on the strand), because everything worked again afterwards. It’s not much to look at in daylight, but it’s absolutely magical after dark. And, above all else, the holidays should be magical. Onward, then, to the eggnog. Oh, and I guess I have another canvas to light up. 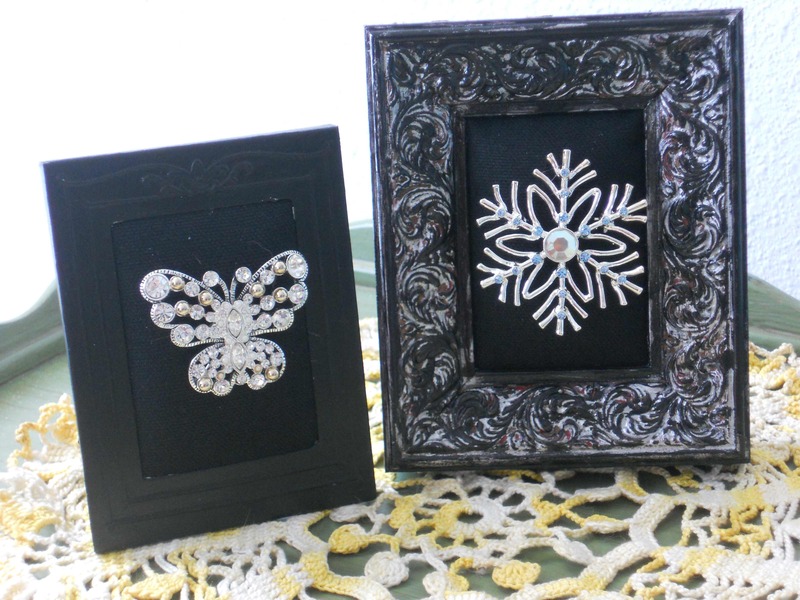 I’ve had several canvas art projects pinned to my Pinterest craft board for MONTHS. My favorites involved silhouettes, but the instructions invariably called for purchasing vinyl cutouts. 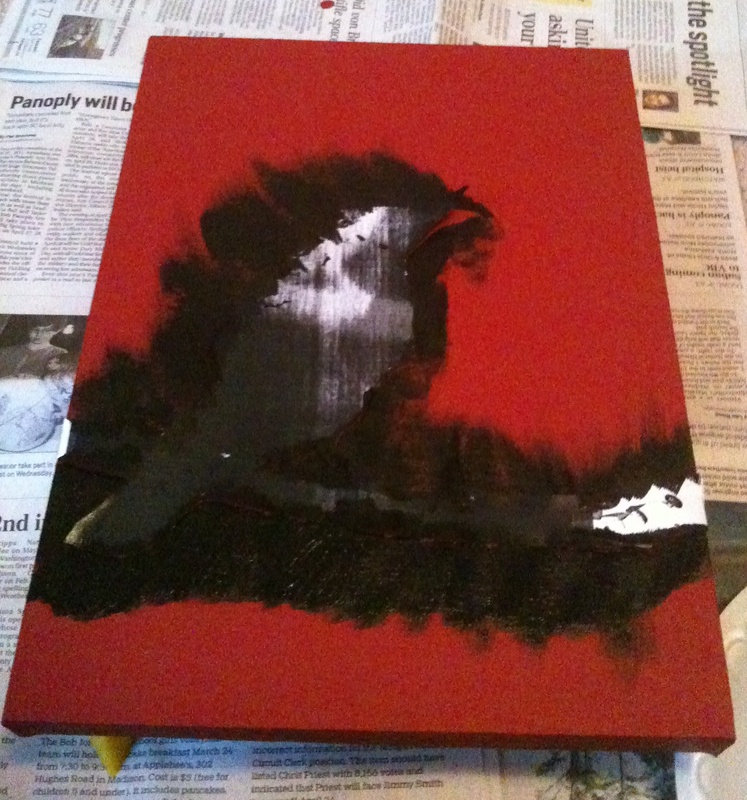 I didn’t understand why I couldn’t just PAINT a silhouette onto the canvas, because, you know, paint is cheap. And in my garage. Silhouette time. I can’t tell you exactly where I found the stencil, but if you make sure your virus protection is updated and google “free stencils,” you’ll find tons of candidates. 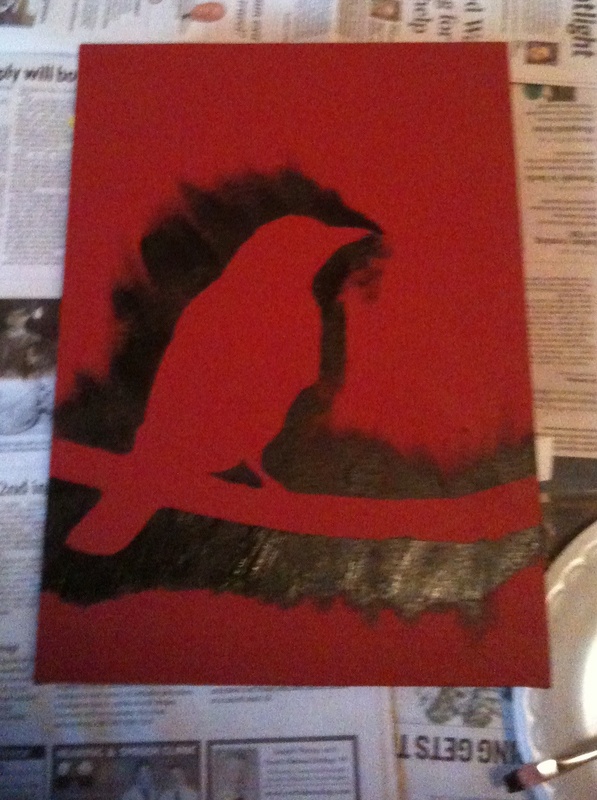 I chose a bird, partly because it looked easy to cut out and partly because of Porlandia’s “put a bird on it” spoof. I printed out the stencil and carefully cut out the design with scissors. I debated whether to try to transfer the stencil to wax paper or foil for cleaner painting, but decided that the paint likely wouldn’t go through the paper. 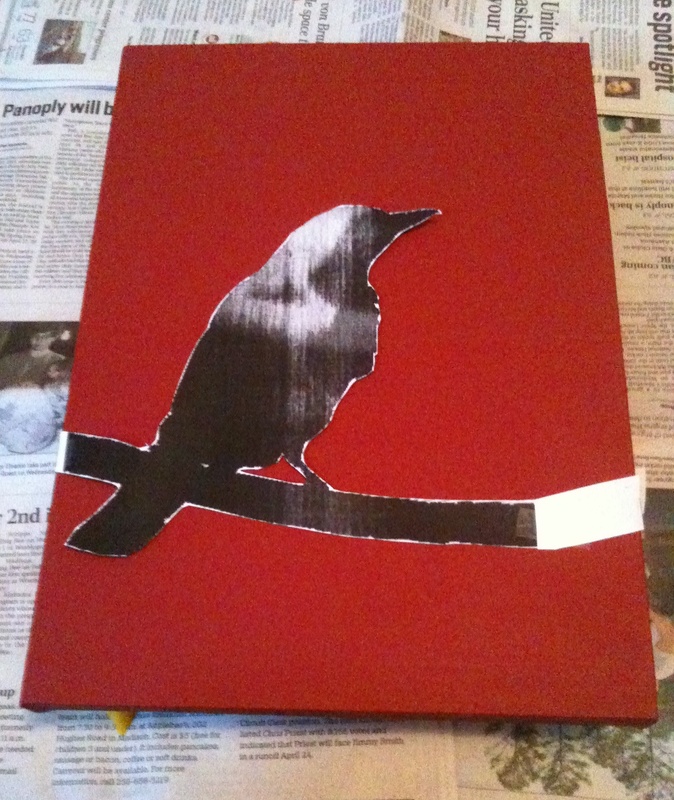 And if it did, I could just paint everything black and make silver birds later. Accidental Craftiness 101: Plan for Failure. The design fit almost PERFECTLY on the canvas. I only had to cut out a 2-inch slip of paper to extend the branch all the way across. 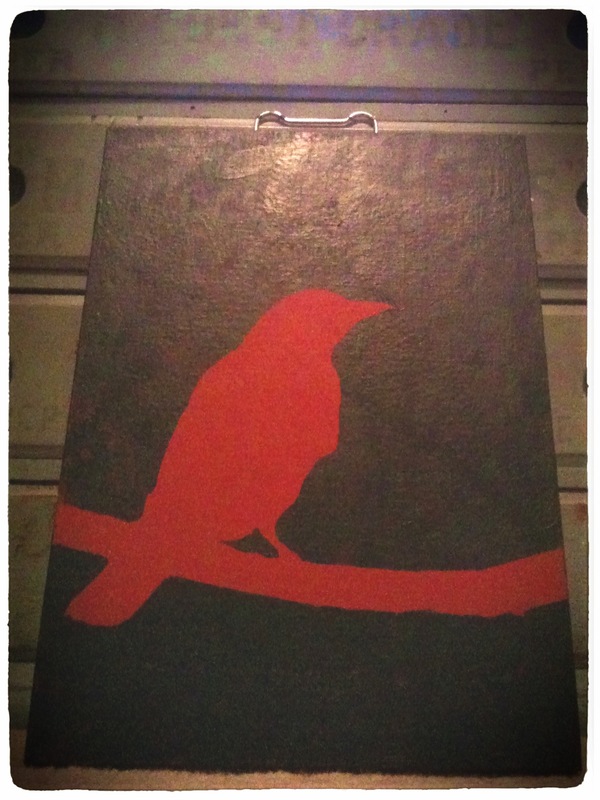 I folded over the ends of the branch and taped them down on the sides of the canvas. I call this the messy part because HOW MUCH black paint did I get on my fingers? A LOT. I probably should have taken a picture of THAT, only it wouldn’t be that much different from a picture of the normal state of my hands. Today, for example, I have eyeliner under two of my left fingernails. EYELINER. After completely surrounding the silhouette pattern with black paint, I carefully pulled away the tape and lifted the paper off of the canvas. Voila … a sharp bird silhouette. My next decision was whether to try to leave a subtle black aura around the silhouette or fill in the rest of the canvas. I’m not good at subtlety, and even as I was telling the husband about my decision-making process I was filling the canvas with black paint. 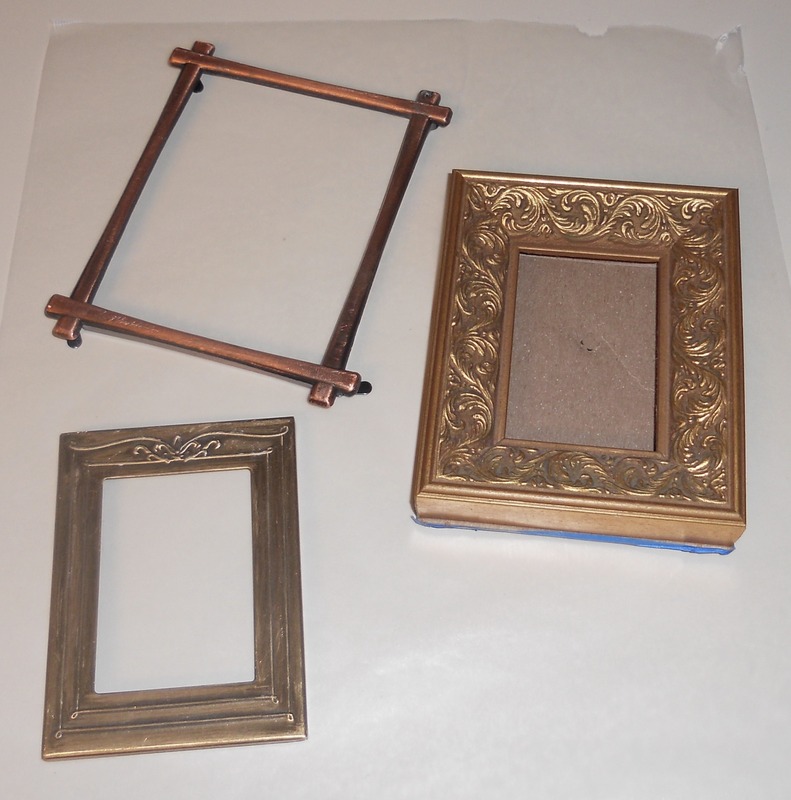 A completed craft project with no cuts, bruises, broken fingernails or glue-gun injuries? WIN. Now I just have to decide where to hang it. 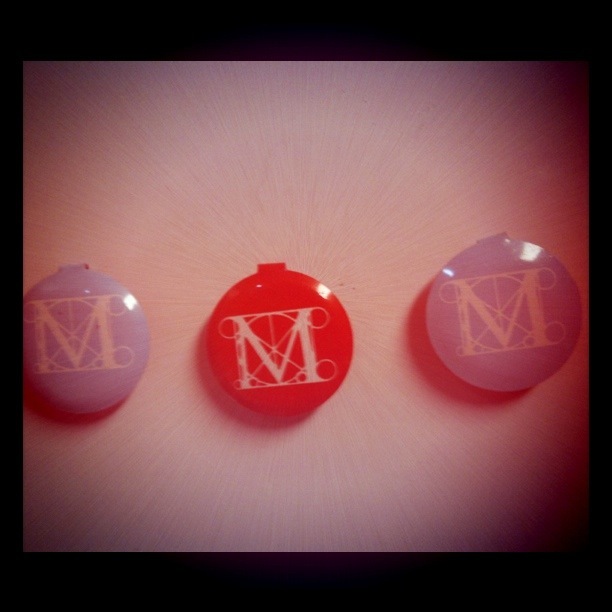 I finally got around to turning my Metropolitan Museum of Art admission buttons into useful souvenir refrigerator magnets. I simply glued a small, round magnet onto the back of each button. Yes, they’re metal and the magnets would have stayed attached without glue, but they would have also popped right off the magnets when anyone picked them up off the fridge. Points for using junk-drawer souvenirs that would have eventually been thrown away. And more points for using the glue gun without incident.